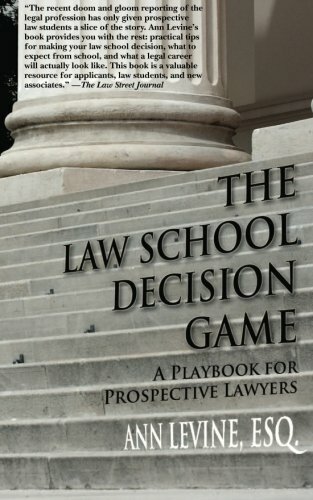 Whether you’re considering law school or are already committed, "The Law School Decision Game: A Playbook for Prospective Lawyers" explains your choice to enter the legal profession with the candor readers have come to expect from Ann Levine's Law School Expert blog including:•What lawyers do, how much money they make, and how hard they work.•What’s important in choosing a law school. •What BigLaw is really like.•What to consider before taking on student loan debt in today's job market. •What you can do now to increase your likelihood of getting hired later.•What is important in choosing an area of specialization.•What you need to know and do in law school and in the first few years of your career to set yourself up for success.“Law school admissions directors are going to hate this book, but it’s critical for potential lawyers who wish to make an informed decision about their careers before they spend three long years in law school and potentially a lifetime paying off their debt. I know many miserable law students and even more unhappy lawyers who I am sure wish they had read this book before ever taking the LSAT.” Spencer Aronfeld, Esq., author of "Make It Your Own Law Firm".